Waseca Minnesota Insulation Contractor For Attic Insulation, Injection Foam, Soundproofing & Ice Dam Prevention. Are you looking to hire a insulation contractor in Waseca Minnesota? Ryan's is a licensed and insured insulation contractor, offering attic insulation, injection foam, soundproofing, ice dam removal & prevention. With over 30 years of experience Ryan's is Waseca's premier choice when it comes to quality insulation, R-Value checkups, new attic insulation, injection foam services and more. We're one of the only companies in Waseca to use BPI certified installers on every insulation job we undertake. When it comes to your home settle for only the best. We offer the highest rated insulation products at the best possible price. We never cut corners or use an insulation product that under-performs. Today's wide range of energy efficient solutions means there's never been more choice when it comes to hiring your insulation contractor. More and more homeowners are upgrading their homes insulation because of higher energy bills. You can experience immediate energy savings when upgrading your insulation. Many homeowners tell us that their insulation paid for itself within the first year of being installed. The savings experienced through your energy bill can be all the financing you need to make an environmentally sound decision that affects the comfort of your home and the size of your wallet. Give Waseca's top insulation contractor a call today! Many of our customers call for soundproofing services. When it comes to soundproofing a building or room we utilize a variety of different acoustic insulation products, injection foam and other soundproofing techniques. Give Waseca's top soundproofing contractor a call today. Both residential and commercial soundproofing available. Don't settle for ice dams on your roof. Ryan Insulation offers ice dam prevention to Waseca and the surrounding area. 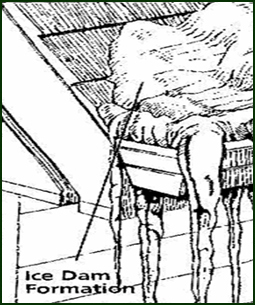 Ice dams can damage your roofs integrity, which can be costly to fix. Upgrading your homes insulation and having your ventilation checked can reduce or prevent ice dams from forming on your roof. Call Ryan's today for a free quote on ice dam prevention.